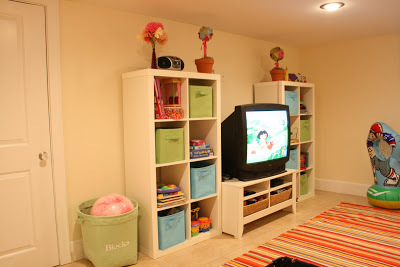 I forgot to post pictures of our finished basement, which has been converted to a playroom. I love my basement now. It’s so nice and refreshing to walk down the stairs and actually see drywall up, paint, recessed lighting, a ceiling and flooring. I’m starting to enjoy doing my laundry. And most importantly, my kids love it. This is where all their toys are located. Where they can run around and be crazy. And make a mess. 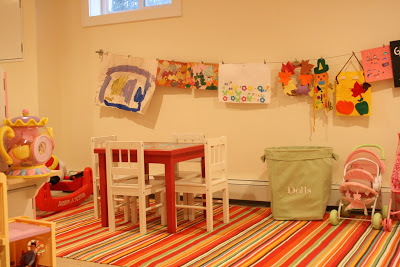 Lucas and Stella both have their own little play area, and I love to see their imagination expand. Our contractor built a huge closet for me, so I can store jewelry packaging material, gift wrapping supplies, craft projects, books and large toys. Because it’s a basement, I wanted to make it colorful, bright and light so it didn’t feel like a dungeon, and it would be inviting for the children to play. I bought colorful, striped rugs that were on sale at Pottery Barn. 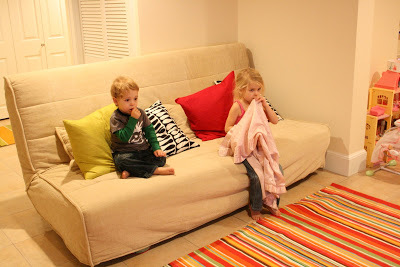 The bookshelves, TV stand and sofa bed are from Ikea. I didn’t want a lot of furniture down there because it would restrict the children’s play area. I also bought the cable picture gallery system at Ikea. Stella loves this because she can display her artwork. We are also going to change it out with the holidays. In the future, I’ll get some prints to hang on the wall. I love it! what a great place for them to play. Ooh, I love it! I want to see the “mommy closet”. Looks great. My kids would love to come over and play. Hope one day that will happen. Be looking out for super cheap tickets and we’re there. The playroom saves my sanity. I love having all the toys in one spot, not divided up between bedrooms. Good work, it looks beautiful! I LOVE IT!!!! I love all the bright colors. I can’t wait to see it first hand soon. LOVE the basement. And I’m so glad you mentioned the Ikea cable picture gallery system. I have been looking for something exactly like that! 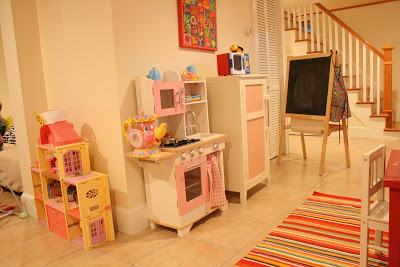 Can I come play in your new toy room? I see it and have an urge to sit down and color! it came out so great, i LOVE it! It’s beautiful. You will so love having that space all finished up. Looks like play time to me! looks great Darleen, do you know what the TV stand/shelving “system” is called from Ikea? I’m looking for something similar. Darleen it’s wonderful! 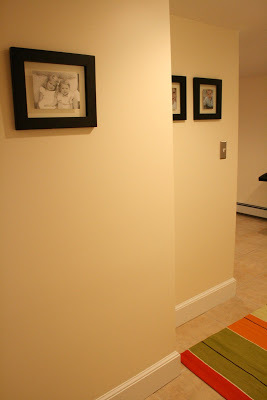 Nice choice of colors and keeping it light and bright in the basement for the kiddies. This will be a place for imaginations to grow! You probably don’t remember me, but I was Marleen’s missionary companion when you took her out for pizza that Christmas. It’s nice to see how you’ve been blessed since I last saw you. I enjoy peeking at your blog- I love your style. Your kid’s room looks really great. Looks fantastic and fun, you guys did a great job! I absolutely love all the colors! It is so awesome…we need to get us one of those! Today is the day and I’m thinking about you and your family. Hope all went well and can’t wait to see the new baby Meier! You did a great job! I want to come and play.